Each pad contains 25 or 50 sheets of bright white, 70 lb (114 gsm), acid-free paper. The paper is receptive to graphite pencil, colored pencil, soft pastels, charcoal, oil pastel, and markers. Pads are spiral bound on the short side. These pads contain bright white, 70 lb (140 gsm), acid-free paper. 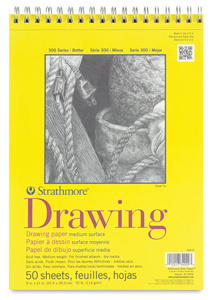 The paper is receptive to pen and ink, pencil, crayon, charcoal, watercolor, and markers. Pads are spiral-bound on the short side. 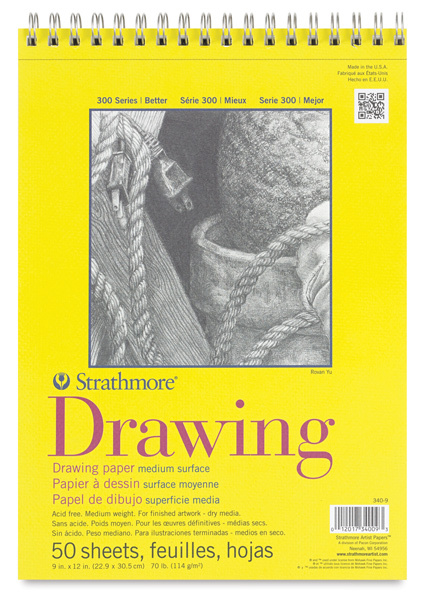 Drawing Pad, Wire Bound, 50 Sheets, 9" × 12"